Section 31 Star Trek Spinoff Coming to CBS All Access | Nerd Much? It’s pretty clear at this point that the CBS All Access platform is the home for all things Star Trek. With four projects already in the works, a fifth is now confirmed. The network has announced that a Section 31 Star Trek spinoff is coming our way. The show will focus on Michelle Yeoh’s Captain Philippa Georgiou. 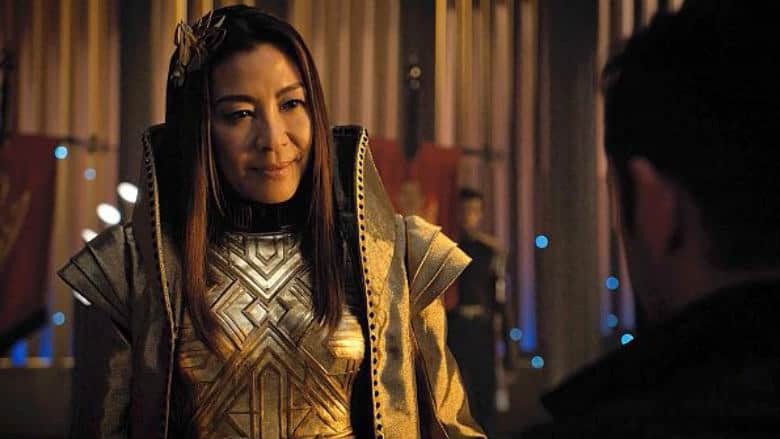 Fans had an idea this potential Section 31 Star Trek spinoff could be in the works when a deleted scene from Star Trek: Discovery was released depicting Georgiou being approached by a member of the group. Yeoh will still take part in Season 2 of Discovery, but she’ll be leading this new project as well. The Section 31 Star Trek spinoff will be written by Bo Yeon Kim and Erika Lippoldt. Listed executive producers include Alex Kurtzman, Heather Kadin, Rod Roddenberry and Trevor Roth. CBS also states that Aaron Baiers will co-executive produce the series alongside Kim and Lippoldt. It’s a prosperous time for Star Trek fans. Discovery returns to CBS All Access for Season 2 later this week. Patrick Stewart returns to the franchise with a Jean-Luc Picard led show later this year. And an animated comedy series entitled Star Trek: Lower Decks will focus upon the crew that handles the dirty work behind the scenes. In 2019 and beyond, there’s certainly a lot to be excited about.